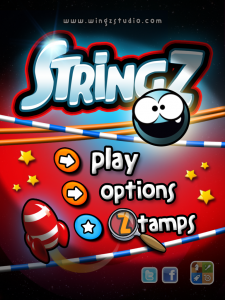 StringZ-HD Review – Physics iz fun!! What kid doesn’t love bouncy balls? I mean, you haven’t truly lived until one comes flying at your head when you’re driving on the highway with two sugar-laden children hooting like drunk monkeys in the back seat. I would like to think that this means they’ll have a firm grasp on physics by the time they go to school, but they probably just love to see how many walls the ball can bounce off of before Mommy flips her lid. StringZ-HD has contained the wildness of a bouncy ball and turned it into an orbital blue alien aptly named Z. The goal is to get Z back to his homeland by helping him reach his rocket by stretching, maneuvering, and angling strings and elastics. Bonus points if Z collects all 3 stars in each levels on the way to his rocket. So you think you’re ready to tackle physics, yes? Think again! By the second level I was already grumbling with frustration as Z tipped over the edge of one of my strings over and over and over again. And this was all before I met with bombs, electric fences, and rotating meteors. 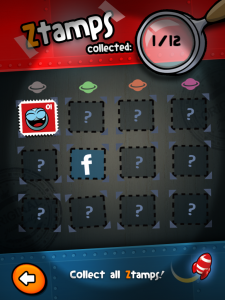 Luckily I managed to find a Ztamp – a stamp graphic that marked my progress in the levels. I didn’t even bother showing my four-year-old this game as I knew it was just beyond his skill level. He would surely have gotten frustrated very quickly. This is definitely a challenge for school-aged children, and for a limited time, it’s free – definitely worth a download. Because, really, “It was a bouncy ball” is not a great excuse to help you get out of a speeding ticket on the highway. It helps for players to have some understanding of basic physics. 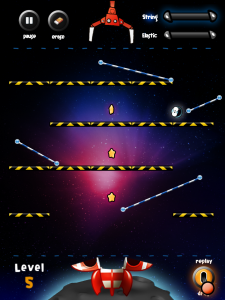 3 Responses to StringZ-HD Review – Physics iz fun!! My kid loves this game! he is 7 year old! Claire, that’s great to hear, and I’m happy to see our age estimate was on target!